In its local manifestations this disease resembles the human ailment usually described as "mumps", but the two affections are quite distinct from each other. Mumps is a specific contagious fever communicable from person to person. 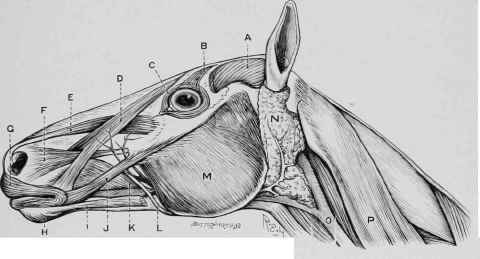 There is no distinct disease of the salivary glands in the horse possessing infectious properties, although they not infrequently become inflamed in the course of infectious diseases of another sort. Fig. 92. 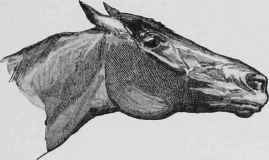 - Head of Horse, showing Positions of the Parotid Gland and Duct. A, Temporalis muscle. B, Levator palpebrae. c, Orbicularis palpebrarum. D, Supernaso-labialis or Levator labii sup. alaeque nasi. E, Supermaxilo labialis or Levator labii superioris proprius. F, Supermaxilo nasalis or Dilator naris lateralis. G, Orbicularis oris. H, Mento-labialis. I, Maxilo-labialis or Depressor labii inferioris. J, Zygomaticus. K, Buccinator. L, Parotid duct. M, Masseter muscle. N, Parotid gland, o, Jugular vein. P, Mastoido-humeralis muscle. Inflammation of the parotid gland (fig. 93, p. 260), as it occurs in the horse, is mostly a symptomatic affection arising in the course of an attack of strangles or influenza. In some exceptional cases it results from cold, and we have known it to be induced by the entrance of foreign matter into the excretory duct which conveys saliva into the mouth. Parotitis may be acute, when the inflammatory action is severe and sometimes results in the formation of an abscess in the substance of the gland, or it may pursue a chronic and abiding course ending in permanent enlargement and induration of the organ affected. Indications of the disease in the former case are marked by an enlargement extending from below the ear downwards towards the throat. The swelling is hot and painful to the touch; at first hard and resisting, but, should suppuration take place, a soft fluctuating point appears, denoting the formation of abscess. In this condition the head is extended and the nose poked out (fig. 93), there is some trouble in swallowing, and the breathing becomes difficult, and is sometimes accompanied by a loud roaring sound. Should the abscess point inwards instead of coming to the surface, it may be expected to break into the throat. This will be made known by an escape of white matter down the nostrils and a sudden subsidence of the more acute symptoms. The difficulty in swallowing will now disappear almost at once, and any abnormal sound that may have been emitted in breathing is no longer heard. The constitutional disturbance which may have existed will now subside and the general health become re-established. In less severe attacks the swelling of the gland is inconsiderable, and there is no disposition to form matter. In these cases the enlargement may altogether subside, or in part remain permanent in the gland. Treatment. 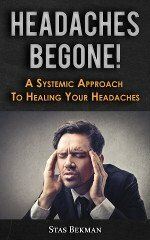 - The object of treatment should be to subdue local inflammation and cut short the disease, thus guarding against those extreme structural changes involved in the formation of an abscess, as well as that too common consequence - roaring. Hot poultices to the throat should be promptly applied, and these may be continued without intermission until the disease subsides. Where poulticing cannot be thoroughly carried out, and frequent changes made, as sometimes occurs, it is better to rely on counter-irritation. This may take the form of a mustard poultice, or turpentine liniment, or a mild dressing of the oil of can-tharides - one or the other - repeated thrice or oftener, as may be required. Where swallowing is difficult and the formation of an abscess internally is suspected, the ripening of the abscess will be hastened by repeated fumigation of the throat with the vapour of hot water to which turpentine has been added. This may be accomplished by means of a nose-bag containing scalded bran, over which a little oil of turpentine has been sprinkled, or the saw-dust of pine-wood will answer the purpose equally well. A small quantity of belladonna electuary inserted into the mouth two or three times a day will also assist in subduing local pain and add to the comfort of the patient. Well - scalded bran and oatmeal, with pulped roots, and a liberal allowance of linseed gruel, will form a suitable diet, and the addition of iron and vegetable tonics may also be required to uphold the strength and hasten recovery. Careful search should be made from time to time for the formation of abscess, and so soon as it is found to "point", i.e. fluctuate under pressure of the finger, it must be freely opened and the matter allowed to escape. All that is now required is to keep the wound clean by sponging it with antiseptic solution, and protecting it by a pad of cotton-wool under a bandage. If after the wound is healed the gland still remains enlarged, a cantharides or iodine blister ought to be promptly applied and repeated if necessary.